Every tournament guarantees some glorious moments; some wonderful sixes, great motions of fielding, epic spell of bowling and so on. However, the matches that don't fade away, just like the Axe Signature line of body perfumes, are often the small fish beating the whale. Over the course of history, there hasn’t been a single tournament where a major upset didn’t occur just like the fable where David beat Goliath. Be it the FIFA World Cup or the cricket World Cup, upsets always find their way through to a tournament. A total of 6 World T20 tournaments that have been played and in each one of them, a team has beaten another one despite the odds being against it. 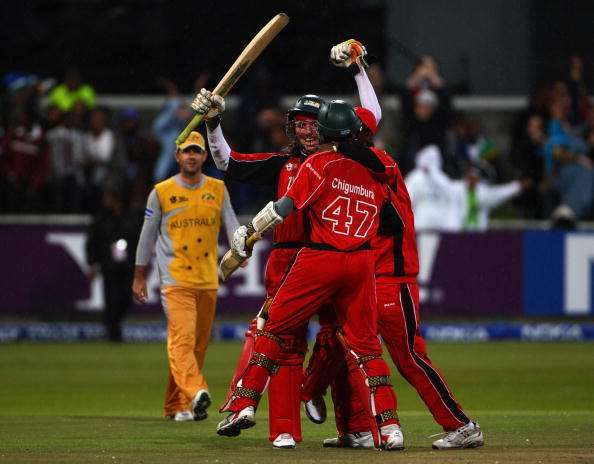 The Zimbabwe team rejoices after defeating Australia in the World T20 2007. This has to go down as one of the biggest upsets in not only the history of World Cup T20, but in cricket altogether. defend it, but a brilliant Brendan Taylor had something else in mind. His 45-ball 60 engineered a great win against the Kangaroos, earning plaudits for himself and his team and giving hope the underdogs.